Crowdsourcing ideas have been developed and initially applied in the private sector, first in the creative and design industries, and subsequently in many other industries, aiming to exploit the ‘collective wisdom’ in order to perform difficult problem solving and design activities. It was much later that government agencies started experimenting with crowdsourcing, aiming to collect from citizens information, knowledge, opinions and ideas concerning difficult social problems, and important public policies they were designing for addressing them. Therefore, it is necessary to develop approaches, and knowledge in general concerning the efficient and effective application of crowdsourcing ideas in government, taking into account its special needs and specificities. 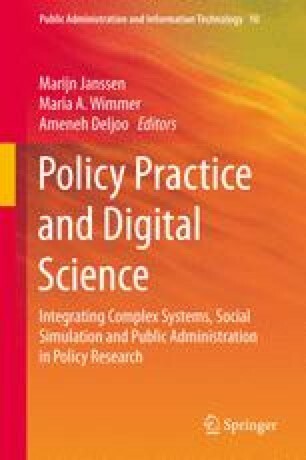 This chapter contributes to filling this research gap, by presenting two novel approaches in this direction, which have been developed through extensive previous relevant research of the authors: a first one for ‘active crowdsourcing’, and a second one for ‘passive crowdsourcing’ by government agencies. Both of them are based on innovative ways of using the recently emerged and highly popular Web 2.0 social media in a highly automated manner through their application programming interfaces (API). For each of these approaches, the basic idea is initially described, followed by the architecture of the required information and communications technology (ICT) infrastructure, and finally a process model for its practical application.